Mullin's World: Is there another Republican "good man"? Is there another Republican "good man"? Finally a Republican that has a streak of decency and honesty. Sen. Tom Coburn (R-Ok) committed sacrilege today when he criticized FOX NEWS and says Nancy Pelosi is a nice lady. 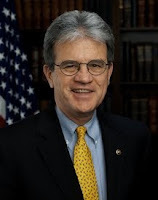 Senator Coburn has had a moment of common decency, and maybe clarity. His is critical of FOX NEWS as being un-American and with an agenda and he calls for people to get their news from other sources than FOX. He characterized FOX as being bias and not being truthful. From a Republican it is refreshing and now we have to wait to see if his act of decency is catching and another Republican has the courage to step forward and criticize FOX NEWS and support Sen. Tom Coburn. Is there another Republican "good man"?